Subtly nod to your favorite caffeinated drink with this soft scarf covered in abstract coffee beans. A few things in life perfectly complement cool, crisp air. For us, the list tops off with 1. A hot cup of coffee. 2. Soft, cuddly cold-weather wear. This gauzy wool scarf has number two covered, while giving a little nod to number one. 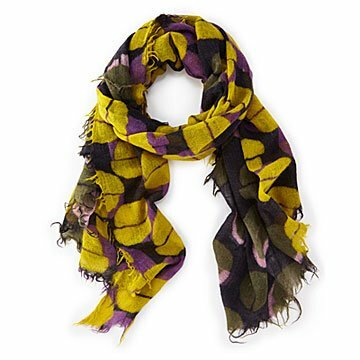 Decorated with colorful, abstract coffee beans, the bias cut scarf (cut at a diagonal on the ends) pays homage to the beloved caffeinated drink. To top it off, a delicate fringe surrounds its outer edges. Snuggle up in it on your next morning espresso run, or give it to a friend who never shows up without a double latte in hand. Made in China.